Watching this bristling and bruising, tense yet tender revival of David Mamet’s 1975 play American Buffalo, I was thrilled to be reminded of how brilliantly Mamet can write. But I was also saddened to think of the recent dwindling of his talents that has produced such dramatically arid plays as November, Race and The Anarchist over the past eight years. Last seen in the West End more than 30 years ago, when Al Pacino led the cast of the import of a 1983 Broadway revival to the Duke of York’s, American Buffalo is a modern masterpiece. The dialogue crackles with tension, wit and the competitive power-play between three men who become intent on reclaiming a buffalo nickel that has been undersold in the junk shop that one of them runs. It’s thrillingly theatrical stuff, and director Daniel Evans extracts every ounce of feeling and fear from his three superb leading actors. A vocally and physically much-altered Damian Lewis captures perfectly the swagger of a man who suddenly spies an opportunity to make some cash. 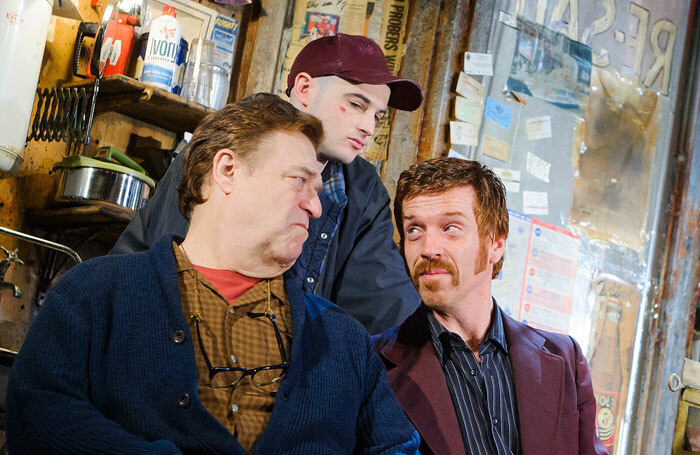 The bulky John Goodman exudes personality as the shop-owner while Tom Sturridge as his nervy sidekick suppresses his, both to equally stunning effect. The play oozes atmosphere and menace, but has a compensating human heart. It’s partly about the competitiveness and camaraderie of male friendship, and the playing of it is finely tuned to offer both. A fourth player is the magnificently crowded jumble of a set designed by Paul Wills.